Stainless steels are primarily used when corrosion or oxidation is a problem. The function that they perform cannot be duplicated by other materials for their cost. Over 50 years ago, it was discovered that a minimum of 12% chromium would impart corrosion and oxidation resistance to steel. Hence the definition “Stainless Steels”, are those ferrous alloys that contain a minimum of 12% chromium for corrosion resistance. This development was the start of a family of alloys which has enabled the advancement and growth of chemical processing and power generating systems upon which our technological society is based. Frequently the mills are buying their raw material in “L” grades, but specifying the physical properties of the straight grade to retain straight grade strength. A case of having your cake and heating it too. This results in the material being dual certified 304/304L; 316/316L, etc. The “H” grades contain a minimum of .04% carbon and a maximum of .10% carbon and are designated by the letter “H” after the alloy. People ask for “H” grades primarily when the material will be used at extreme temperatures as the higher carbon helps the material retain strength at extreme temperatures. You may hear the phrase “solution annealing”. This means only that the carbides which may have precipitated (or moved) to the grain boundaries are put back into solution (dispersed) into the matrix of the metal by the annealing process. “L” grades are used where annealing after welding is impractical, such as in the field where pipe and fittings are being welded. Restricts maximum carbon content to 0.030% max. and silicon to 0.75% max. for extra corrosion resistance. Requires molybdenum content of 4.00% min. Requires molybdenum content of 4.00% min. and nitrogen of .15% min. These types have been developed for corrosive resistance for repeated intermittent exposure to temperature above 800 degrees F. Type 321 is made by the addition of titanium and Type 347 is made by the addition of tantalum/columbium. These grades are primarily used in the aircraft industry. More about the physical and chemical properties of Austenitic Grades of stainless steel can be found HERE. Martensitic grades were developed in order to provide a group of stainless alloys that would be corrosion resistant and hardenable by heat treating. The martensitic grades are straight chromium steels containing no nickel. They are magnetic and can be hardened by heat treating. The martensitic grades are mainly used where hardness, strength, and wear resistance are required. Contains added phosphorus and sulphur for improved machinability. Typical applications include screw machine parts. Contains increased carbon to improve mechanical properties. Typical applications include surgical instruments. Contains increased chromium for greater corrosion resistance and good mechanical properties. Typical applications include high strength parts such as valves and pumps. Further increases chromium and carbon to improve toughness and corrosion resistance. Typical applications include instruments. More about the physical and chemical properties of Martensitic Grades of stainless steel can be found HERE. Ferritic grades have been developed to provide a group of stainless steel to resist corrosion and oxidation, while being highly resistant to stress corrosion cracking. These steels are magnetic but cannot be hardened or strengthened by heat treatment. They can be cold worked and softened by annealing. As a group, they are more corrosive resistant than the martensitic grades, but generally inferior to the austenitic grades. Like martensitic grades, these are straight chromium steels with no nickel. They are used for decorative trim, sinks, and automotive applications, particularly exhaust systems. Has molybdenum added for improved corrosion resistance. Typical applications include automotive trim and fasteners. 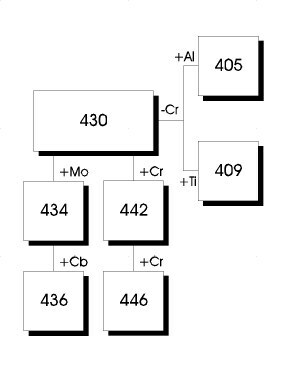 Type 436 has columbium added for corrosion and heat resistance. Typical applications include deep-drawn parts. Has increased chromium to improve scaling resistance. Typical applications include furnace and heater parts. Contains even more chromium added to further improve corrosion and scaling resistance at high temperatures. Especially good for oxidation resistance in sulfuric atmospheres. Precipitation hardening grades, as a class, offer the designer a unique combination of fabricability, strength, ease of heat treatment, and corrosion resistance not found in any other class of material. 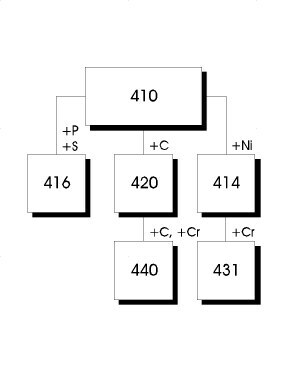 These grades include 17Cr-4Ni (17-4PH) and 15Cr-5Ni (15-5PH). The austenitic precipitation-hardenable alloys have, to a large extent, been replaced by the more sophisticated and higher strength superalloys. The martensitic precipitation-hardenable stainless steels are really the work horse of the family. While designed primarily as a material to be used for bar, rods, wire, forgings, etc., martensitic precipitation-hardenable alloys are beginning to find more use in the flat rolled form. While the semi-austenitic precipitation-hardenable stainless steels were primarily designed as a sheet and strip product, they have found many applications in other product forms. Developed primarily as aerospace materials, many of these steels are gaining commercial acceptance as truly cost-effective materials in many applications. Superalloys are used when 316 or 317 are inadequate to withstand attack. They contain very large amounts of nickel and/or chrome and molybdenum. They are usually much more expensive than the usual 300 series alloys and can be more difficult to find. 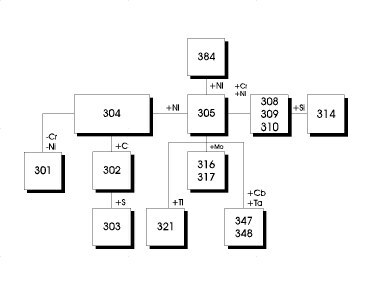 These alloys include Alloy 20 and Hastelloy.